If you have not previously attended any of our walks then do give them a try. Basset Hounds are naturally pack animals and love the opportunity of ‘letting-off steam’ by chasing across the countryside together. Their owners quite enjoy it as well! Dusty and I used to come to Abbots Wood many years ago as it was a favourite walk of our previous Bassets, Emily and Teddy. Annie and Cass have been before, but not on the walk we did this time. 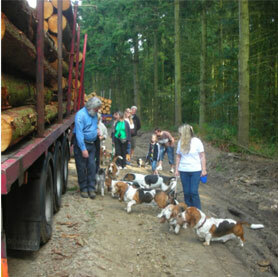 We were very pleased to see a total of fourteen Bassets - plus their owners - as we knew several people were on holiday and it was also quite a journey for some members. The previous week had been warm, sunny and dry and we were hoping it would last. As it was, we could not fault the weather; but the walk did not go according to plan, as Trudy’s Mollie (together with a couple of boy dogs) all thought it would be fun to explore the woods. The boys all came back, but not Mollie. Trudy and Frankie then left the main party to see if they could find her. What a blessing a mobile ’phone is! As Roy, Terry and Dusty had all turned back, they were ’phoned and it turned out that Mollie had returned to the car park and was sitting by Trudy’s car. Much relief all round and the rest of us continued to the lake, where there were several fishermen. Being Bassets you can imagine what happened. ‘What’s going on there?’ they seemed to be saying. Eventually, they lost interest in the very patient fishermen and we walking to the car park without further mishap. We then went to the Old Oak Inn, near the woods, and sat outside in the very warm sunshine, where we had welcome drinks and food from a very wide menu. We wondered afterwards what Zinzi - a Russian guest of Trudy’s who came on the walk - thought of all the mad English people chasing and yelling at their dogs as only Basset people can! (Ed. We all felt for Trudy - but what a smart hound Mollie is to find her way back! ).